My friend Kay, who helps me keep my house in order, is horrified when she sees my Birthday List. Particularly when I count up the number of July birthdays - 26 in all. That’s almost one every day, she exclaims, horrified, adding: how do you even know that many people? The thing is, I love sending greetings cards. I have no idea how much I spend on them annually, especially with postage included, but as far as I am concerned they are Worth Every Penny. I like to think that they give the recipients as much pleasure as I enjoyed buying them. Over the last few days, what with our anniversary, my birthday and the Betweenies Day (as in the day between our anniversary and my birthday) coming in one week, I have had a Card Fest. Every one is special and I only have space to mention but a few - but here goes. My Little Sister has sent me a Bee-Happy card which has been impregnated with wild flower seeds. She loved the one she received from her son on her last birthday so much that she knew exactly which card to buy for me. You can tell that my sister and I share the same opinion on the Value of Birthday Greetings. The only problem, she confides when we chat via FaceTime, is that I won’t be able to save my card in my memory box. You may be thinking that she is assuming that I even have a memory box but this is my sister, remember. She knows me so well. She advises me to take a photograph of my card before I plant it and suggests I organise a small planting ceremony and send her photos to mark progress. The Trio of Rampaging Rascals have each made me a card of their own design. 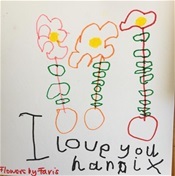 Faris (Rascal Creations 2018 it says on the back of the card) has drawn flowers and added a loving message; Tala (Diva Creations 2018) has filled the front of her card with jellyfish. For originality the subject matter takes some beating. Her twin sister, Lilia (Princess Creations 2018), has drawn pink mermaids on the front of her card. Fortunately I don’t have to guess what they are as her proud mamma has written a description below her drawing which is, indeed, very pink. If not very, well, mermaidy. Since I started making handmade cards at my Crafty Group, I have an even greater appreciation of cards designed and fashioned by their creators. This year I received no fewer than eight handmade cards, each one clearly designed with me in mind and I love them all. The Middle of the Darling Daughters (mother of the Trio, so no guessing who inspired their own creations) has cleverly incorporated on the front of her card the words of “You are my sunshine” in a spiral, a sweet reminder of the fact that this is the song I used to sing to her Trio when they were newborns - and hence too young to protest at my warblings. My friend from schooldays, Pat, has chosen a picture of egrets to grace the front of her card - in honour, she explains inside, of my much-loved Birdy Group. So personal, don’t you know what I mean? Not all my own handmade cards make it into the post-box, only those I am reasonably happy with. I dare say my ratio of success to failure will improve significantly with experience and over time. Meanwhile I can learn a few lessons from my clever, crafty friends. In fact, my delight in each and every one of the greetings cards I have been fortunate enough to receive makes me even more determined that my Birthday List will not be pruned but will be allowed to continue to grow as does my ever-increasing circle of family (just this week I added a new great-nephew to the list) and friends. I won’t tell Mr B. What he doesn’t know can’t hurt him. Can it?